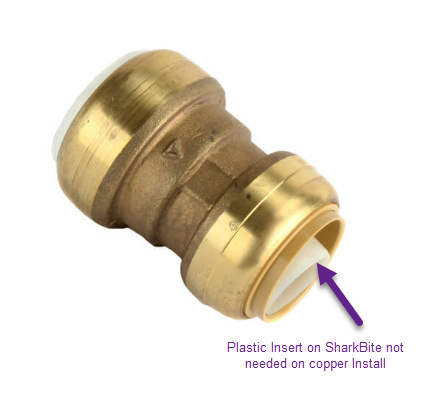 I just installed my Rachio flow meter onto 1" copper using the recommended 1" PVC to CTS SharkBite connectors. Thankfully no real issues arose. The trickiest part I ran into was forcing the copper into the top SharkBite connector on the last connection step…somewhat because of lack of grip and somewhat because of vertical movement restrictions on the pipe. I measured this insert (on 1" connector) to reduce effective pipe diameter by just over 0.25" compared to Type L copper pipe inner diameter. 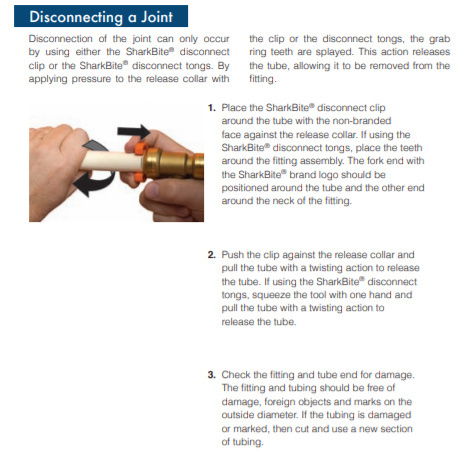 I found instructions from Sharkbite on Home Depot website on how to remove plastic insert. Instructions for insert removal are on page 5 of that guide, but I’ll post the instructions below in case the link dies in the future. For steps 3 & 4, since I didn’t have any SharkBite disconnect tools, I instead drilled a hole slightly larger than insert into a scrap piece of wood. Then, placing the wood on the ground, I aligned connector insert with wood hole and pressed connector down vertically. The insert dropped out with ease. Clearly, Rachio has tested and planned for SharkBite installations without the insert removed, so there is really no reason to remove it other than eliminating whatever pressure loss is being created by the insert. I also saw no reason to leave the insert there since it was easy to remove…so I removed it. @brad @emil From Rachio’s install instructions, it is interesting that for installations with 3/4" cooper that it’s asked to add a 1" diameter section of copper before the connector…yet the insert still would still throttle after the 1" section as well as introduce turbulence from the insert’s leading edge. Rachio…overall I thought the flow meter was easy to install for 1" copper. I found the instructions on the website good and the install videos especially helpful. Many thanks to those who installed before me here on the forum with insight on their installs. I haven’t yet calibrated my meter, but will do so shortly. I learned something new @corfam! I did wonder what that plastic part was for. yep, i didn’t remove that piece and it seems to still work fine and read correctly on my 1" copper install. the video and pictures on the rachio.com site clearly show the edge of that piece still in place. interesting however but i’m glad i didn’t complicate things and just left it in, hopefully that doesn’t in anyway impact the long term function of the flow meter or the leak proof nature of the sharkbite. Yes, agreed. I had studied the documentation carefully and had watched the videos too and noticed the insert was there in all cases. hopefully that doesn’t in anyway impact the long term function of the flow meter or the leak proof nature of the sharkbite. I wouldn’t worry about that. 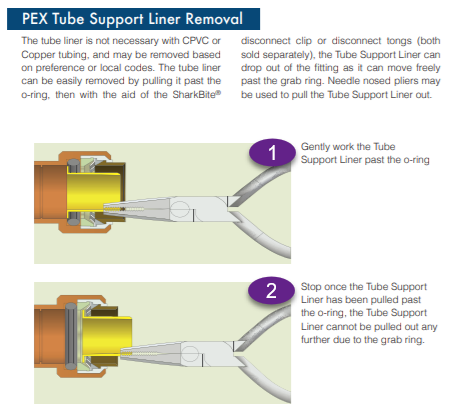 SharkBite’s documentation clearly says removal is optional. 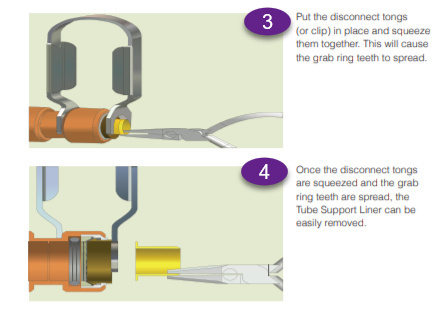 Since all testing by Rachio with SharkBite connectors had the insert in place, I can’t see any unforeseen long term problems either. Liner insert removal was just something that I thought I’d highlight as an option. One of my zones was already close to not having enough water pressure so I wanted to minimize the pressure loss from addition of flow meter. I wish I had seen your post (or that Rachio instructions included a reference to the topic) before I installed my flow meter. It works fine, but like you said the flow is artificially reduced to 3/4”. I doubt there is any way to uninstall the fitting to remove the insert. Seems like too much effort (and some risk) to rework unless there is a flow problem.